I re-learned a very interesting thing at TV Connect this past week; a hard truth that we all need to pay heed to. There are an endless number of OTT platforms competing for market share, and seemingly everyone in Western Europe already is in possession of a system that allows them to deliver content to customers; yet no one is truly satisfied with what they have. Why? Because the demand for innovation will never cease. I lost count of the number of conversations I had with people who already had an OTT service that was working fine, but wanted to see what interesting stuff Piksel are doing. The reason for this continuing desire to see new stuff on their part is simple: the technology that enables these platforms does not interest their customers. Their users don't care how complex and intelligent their backend systems are, all they care about is if it works well all or not. What they demand is that it looks good, is enjoyable to use and is available on all their devices. If these criteria are not met - no matter how brilliant the technology that powers it they will not use the service. All the analytics data in the world is worthless unless you put it to good use. To this end, it was a joy to continue to meet those requests of what interesting stuff are you doing by showcasing a variety of Piksel's multiscreen deployments, from the award-winning OSN Play and Channel 4's 4oD services (including the recent app for Xbox One) to our cutting edge second screen product, 2Si. Exceptional user interface design, intelligent and focussed device strategy and ahead of the curve innovations allow clients to put that all important salt, pepper and flavoring on the steak they are presenting to their customers. It's no longer enough to shove a slab of bland, flame grilled meat in front of them and expect satisfaction, the modern consumer requires a little more sophistication that that. So while one can continue to provide best in class multi-screen services, it is those all important value adds and focus on the customer that while not as inherently important as the technology that powers them are what can make or break a service in the eyes of those that determine whether or not a product will be successful - end users. Without that, we're just competing on platitudes, and no one wins anything in the end. Find out where we're going to be next, and let us know if you would like to hear more from Piksel. 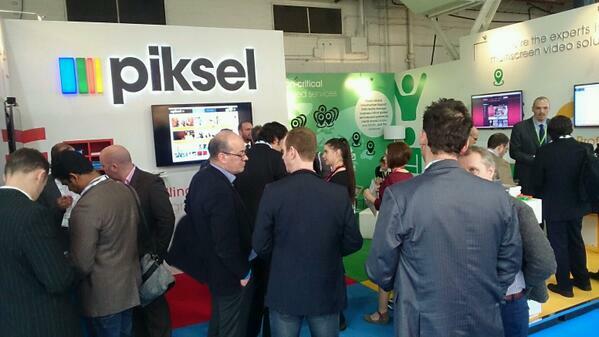 Did you visit TV Connect 2014? Share your experience with us below. Miles Weaver is the Product Manager of Piksel's second screen application, 2Si. He writes on technology, entertainment and culture at www.milesweaver.com. Connect with him on Twitter with @mrmilesweaver or @piksel.